after careful consideration and many restless hours, i had a shortlist of four on wednesday, a short list of two on thursday and a short list of still two on friday… and the list has not become shorter. that means we have two winners! the use of two variations of the stitch pattern give this versatile scarf an interesting structure. 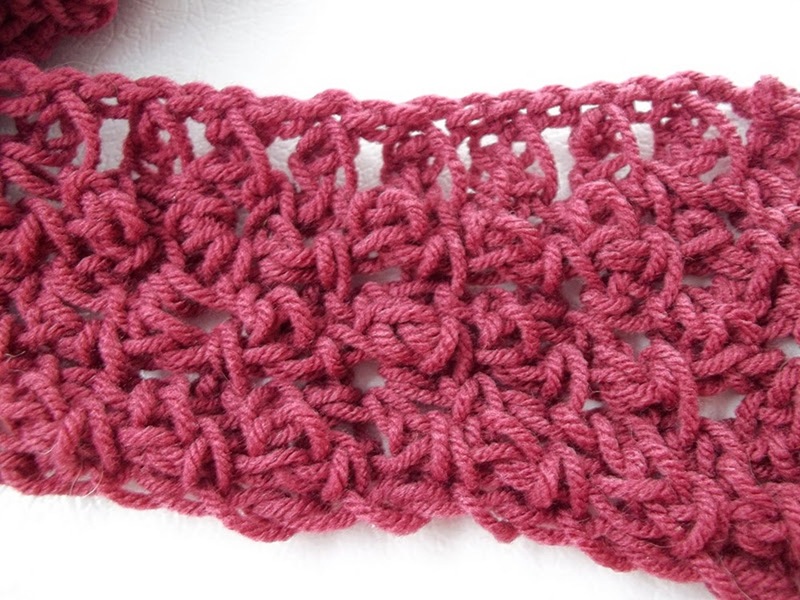 a nice project for other crocheters because the scarf will be beautiful in any color, in thick or thin yarn. lindy’s presentation is well done. an unusual scarf/cowl. her use of colors makes this project extra attractive, the presentation was well done and the post is written in a enthousiast way. donatella’s scarf/cowl seems to be a creative challenge for others. if you like to, please grab the large and/or the small button for your blog. 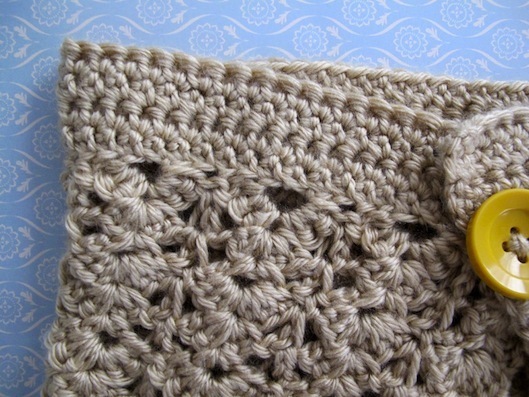 as promised i pinned your projects onto my crochet board on pinterest. thanks to all the participants for showing your crocheting skills to the rest of the world! Categories: blogging, crochet | Tags: contest, crochet contest | Permalink. this is my last blog post about the crochet contest. except the announcement of the winner on saturday and then it’s over. that post will be online between twelve and one o’clock in the afternoon, dutch time. the last few days and weeks, two things struck me most: the variety of designs created with just a simple stitch pattern and the friendliness of the participants. i saw them comment on each other’s blog, they wrote nice comments on mine. so to you: thank you that you have participated and for your efforts. this event i have experienced as enjoyable and perhaps worth repeating. if you are the winner i’ll pin your design on one of my pinterest boards: if there is a pattern or a tutorial on my ‘crochet’ board and if there is no pattern on my ‘crochet inspiration’ board. hopefully this will generate some extra visitors to your blog and will the pin be repinned many times! UPDATE DECEMBER 2012: I AM SORRY BUT I HAVE DELETED MY CROCHET INSPIRATION BOARD. today’s presentation shows you more details. 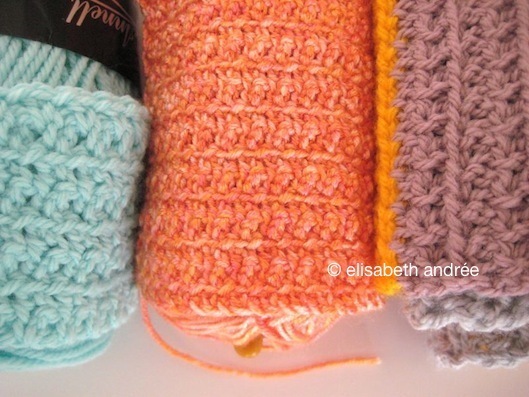 i do not know if crocheters always realize that their two hands together with a hook and yarn create fabric. that they do, you can clearly see on the pictures of the participants. some crocheted fabrics are so beautiful that it is unfortunate that you can not buy it in a store to make clothes or other creations out of it. the problem is that you can cut and work with knitted fabrics and little or not with crocheted. 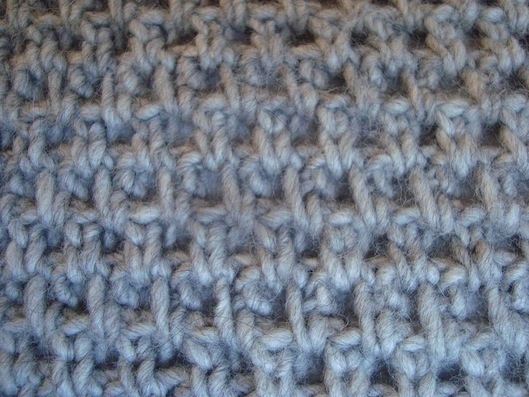 knitted fabrics can be machine-made, crocheted not. 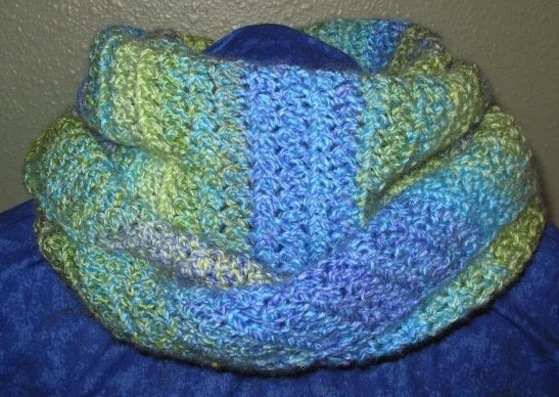 paula is an enthusiastic and for the contest she made two of her cowls in variation 1 of the stitch pattern. she has tried the effects of larger and smaller hooks. i think paula’s work looks neat and the blue stripe gives the cowls some extra panache. jill has made a cushion cover in a beautiful gray shade with creamy shade decorations in variation 1. the embellishments she also made in the same variation. 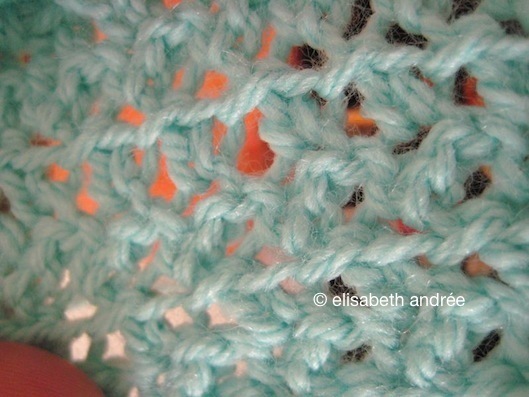 you can find the pattern on jill’s blog. donatella shows a stunning design. she figured out how she could make such a cowl and let us see how she did it so we can make it too. lovely use of colors! 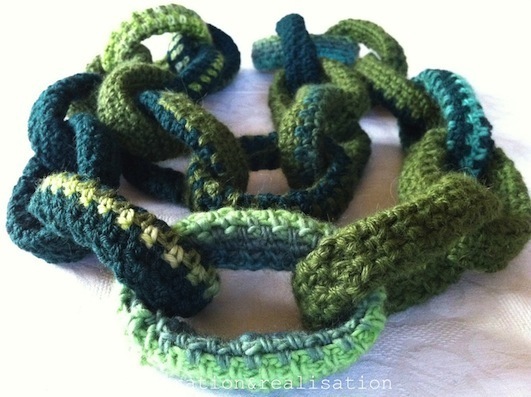 variation 1.
kathryn had crocheted a thin but warm scarf made of yarn she carefully chose. she had used variation 2 and the result is interesting and not average. on her website you can find a step-by-step tutorial. 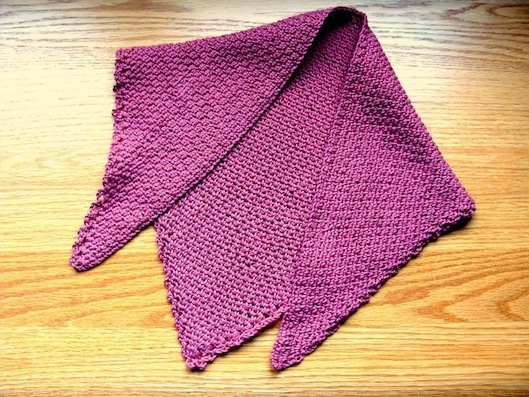 laurinda’s shawl is a beautiful elongated triangle that you can wear multiple ways. she has used variation 3 of the stitch pattern and a selfstriping yarn in watercolors. lindy has created a scarf that i think is versatile. 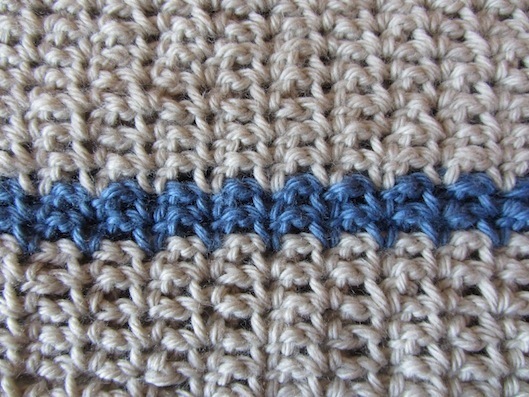 she has used variations 1 and 3 of the stitch pattern giving her scarf also more than one texture. well considered project! lindy describes on her blog how she made it. 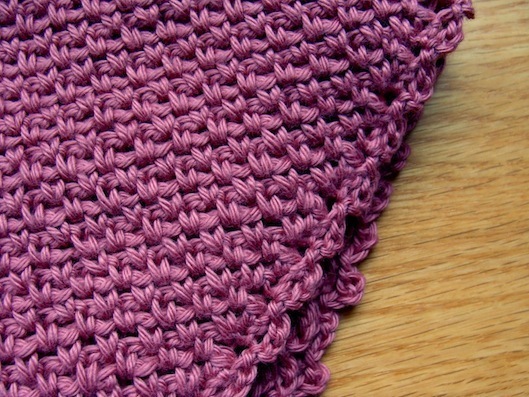 emily also has created a versatile scarf in variation 1. she made a ruffle row by making 3 stitches in every stitch, clever, and the end result is very nice. 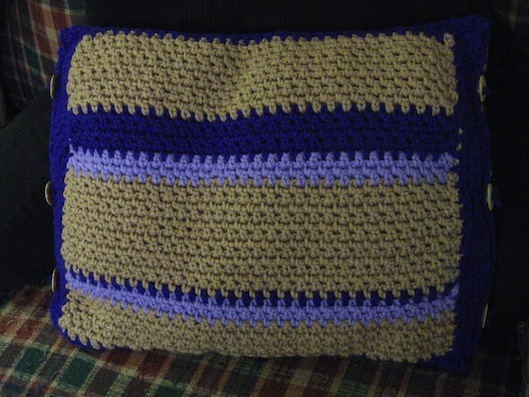 also emily describes on her blog how she crocheted it. 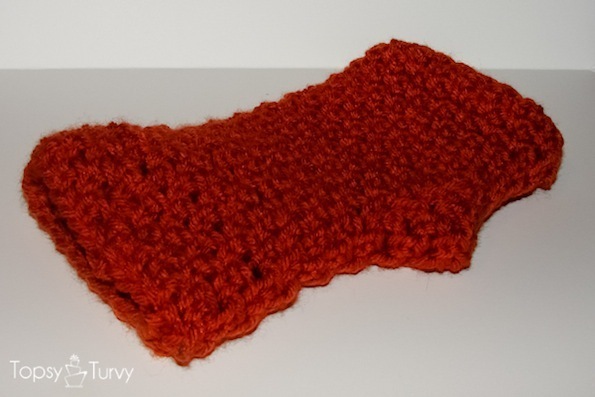 rachel has made a neck kerchief in variation 1. on her picture you can clearly see what a beautiful structure you can create with just simple single crochets and chains. her cat is also happy with it. you can find her basic pattern on her blog. rene’s cushion cover has not an average look and that is – i think – a good thing. she used two variations: 1 and 2. she has solved the problems she encountered in a creative way. sarah’s scarf is elegant and very useable. 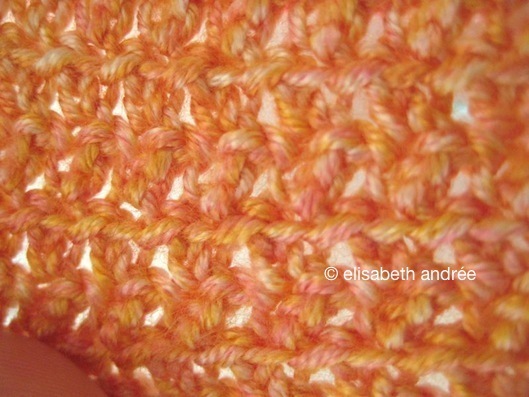 on the photo her yarn looks a bit like a detail of a wicker basket. she has used variation 1 and her pattern is available on her blog. keeping your hands warm and still be able to work or type! ashley has made two pairs (!) of her nice and wearable mittens. 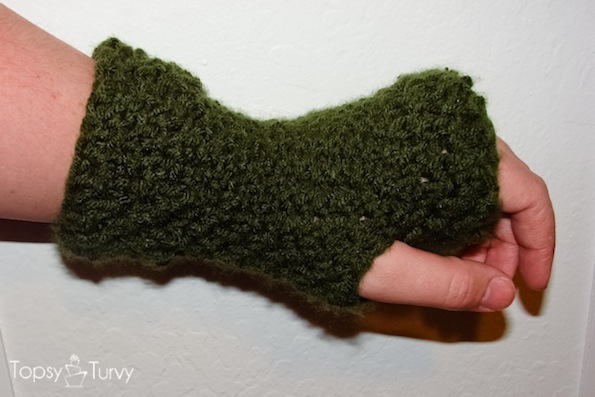 pattern can be found on the website. lindsay has made a great cowl! it is wearable and it has a chic and classic look. she has written down her pattern for you. felicia has crocheted a long narrow scarf that is very stretchy. you can find the pattern on her website. thank you all for your hard work and creativity! tomorrow more about the contest. Categories: blogging, crochet, inspiration | Tags: contest, crochet contest | Permalink. due to a bug i publish this page one day earlier. today the presentation of the work of the participants. all the pictures i made 14 cm high, but i have not been editing them any further. at each project i placed the link to the specific blog post. you will notice that sometimes you still get to the home page. that gives only a problem if the blogger publishes often and when we are further in time, then you will have to search. i have tried to solve the problem, but alas. i do not know if it is the settings of these blogs. you can quickly visit the right post by copying the link and paste it into your browser. tomorrow i present the designs of the participants. participate in a contest in de middle of such a busy time was maybe pretty hard. and for some of you it was not just plain busy, i am aware of that. that makes the presentation tomorrow a showcase for the work of persistent and talented crocheting women. i am impressed with your designs. chapeau to you all! tomorrow is the first presentation and that is only with the names and photos. wednesday is a second presentation with other pictures and accompanied with comment of me. friday we pause (regarding the contest, i mean). saturday is the announcement of the winner. so here you have the program for this week, hope you like it! two of the participants have withdrawn and have sent me a mail. they had to give up for their own good reasons. unfortunately there are others whom have entered as a participant, but have not published work for the contest on their blogs. i do not know the reason why.